Jerry Glaser was the FIRST tool manufacturer to recognize the tremendous potential and advantages of CPM10V (also known as A11) and CPM15V produced by Crucible Steel. Since 1970, Crucible Steel has been producing highly alloyed premium high speed steels, using their proprietary CPM (Crucible Particle Metallurgy) process . The fine structures that result from rapid solidification in the CPM process offer premium characteristics which are highly favorable for the manufacturing of woodturning tools. With no reduction in wear resistance of the tool and reduced grinding-wheel wear, sharpening can be done more quickly, leaving an edge that produces a smoother finish on the work piece. CPM high speed steels are consistently tougher than their conventional counterparts. Vanadium forms the most wear resistance carbides. Although wear resistance tends to increase with total alloy content and attainable hardness, there are notable peaks in the wear resistance curve at the high vanadium compositions. Jerry Glaser was the FIRST toolmaker to implement CRYOGENIC TREATMENT in all steels used in his tools. So when your read that “Powder Metal and Cryogenics is the Future of Woodturning” remember that Jerry Glaser had already envisioned the “Future of Woodturning Tools” since 1995. Being an innovator and pioneer, Jerry Glaser developed the proper methodology to establish the “proper cryogenic temperatures” which enhanced the already superior properties of all Crucible’s Materials. Cryogenic treatment, which is oftentimes referred to as “Cryogenic Tempering”, makes use of ultra-cold conditions in order to alter the actual micro-structure of metals as well as various other substances. When used properly, Cryogenic Tempering eliminates material stress by converting most of the retained austenite to martensite. 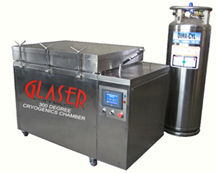 After a lot of research and experimentation, Jerry Glaser also implemented a “cryogenic bath” BEFORE the heat treatment in order to avoid distortion of metal DURING the tempering process. Research shows that impurities such as water and water molecules interfere with the molecular structure in ways that were previously unknown. Because of water’s different properties at different temperatures and pressures, water is the enemy of consistent molecular bonding. Cryogenic processing will not in itself harden metal like quenching and tempering. Most alloys will not show much of a change in hardness due to cryogenic processing. Jerry believed that the double cryogenic treatment applied to his tools would significantly increase the abrasion and fatigue resistance of his tools and prevent metal distortion during treatment. All of the years of experimentation and proven results makes GLASER HITEC tools far “superior” than any other product available in the market today. We strive to follow Jerry’s guidelines in the production of his tools.